Students - I am in Houston, Texas right now, at a conference for English teachers. Tomorrow I will be speaking a little bit about keeping a notebook. (You may know my other blog, Sharing Our Notebooks.) And so, of course I am thinking about notebooks. And one of my family members who kept notebooks was my Great Aunt Tom. My grandmother's sister was my Great Aunt Tom. 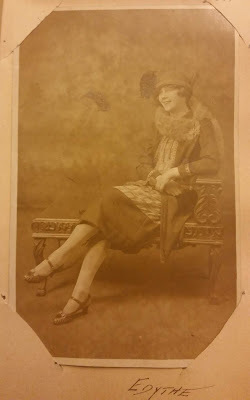 Her real name was Edythe Toebe, and she was a flapper. Folks called her 'Tom' because she was what they called a tomboy, which at the time was a nickname for girls who liked what were considered more boy-like things back in 1910. Here she is, below. Great Aunt Tom really did keep a handprint notebook, and she really did write out her palm reader predictions for some of the handprints in the book. And she really did tell me that when strange things happened, she stopped reading palms. And I really am sorry that I did not ask more questions. I was there when Great Aunt Tom died, and in 2011, I wrote about that day in an essay titled What Can I Do? So today's poem is about an object. It is about a sentence I recall from many years ago. And it is about a feeling too. I did not know what the feeling was until I got to the end of the poem, and then I knew. And then I chose the title. One word - Regret. Which family objects do you wonder about in your home? Allow objects to inform your feelings and allow feelings to help you think about objects. And listen. Always listen. Notebooks are wonderful for gathering snatches of conversation. We never know when we'll need such snatches. 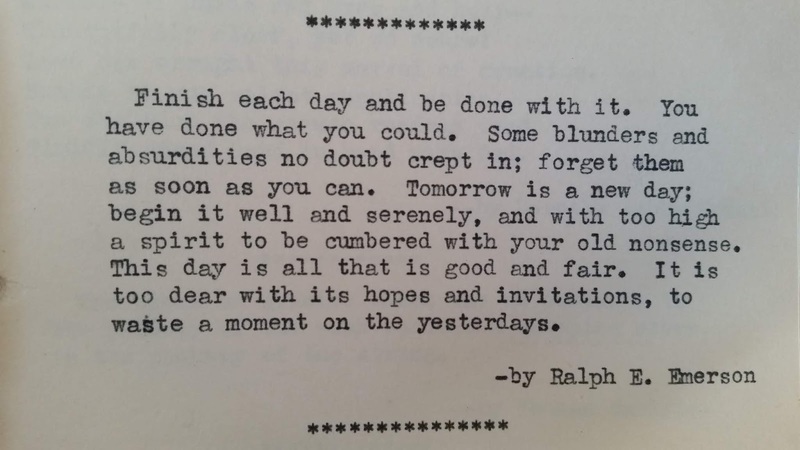 Here is a snip from another one of Great Aunt Tom's notebooks. 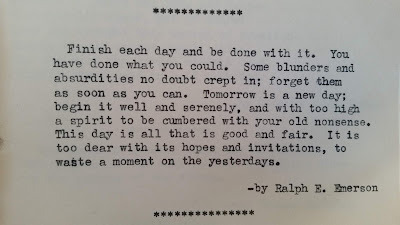 This one is full of poems she loved (some by my Great Grandfather) and quotes such as this one from Ralph Waldo Emerson. The time to ask your curious questions is now. It is always now. Yesterday I met a man whose parents are both Holocaust survivors, and his time to ask is now. Do not wait. We are all walking story books, and no story lasts forever. I feel so lucky to host Miriam Haefner over at my other blog, Sharing Our Notebooks this month! She keeps track of the moon and sky, and I recommend a visit to see and inspire yourself. Too, I am holding a giveaway for a moon journal...to go to a commenter on that post. Linda is hosting this week's Poetry Friday roundup today at TeacherDance with her gentle generosity and a giveaway for new book and print by Rosemary Wells. Please know that every Poetry Friday, we gather together to share books, and poetry ideas all at one blog. Everyone is always welcome to visit, comment, and post. We invite you! Oh my, Amy, this notebook of your Great-Aunt Tom's is a precious thing. I do understand about the questioning. There are many I'd love to go back to ask, especially to my grandparents. When we're young, we ask those 'now' questions, don't we, like "When can we go pick blackberries? or "When is Aunt Jean coming to visit? ", rarely ones for future memory. I'm glad for the reminder, and love your poem and picture. Have a wonderful time at NCTE! This is wonderful. I, too, regret so much not asking more questions of people who are now gone. What a fabulous character your Great Aunt Tom seemed to have been! Enjoy NCTE! Your "What Can I Do?" essay was touching. Such serendipity that you arrived when you did. Maybe you can fictionalize the making of Great Aunt Tom's notebook. It sounds like there are a lot of stories in there. Wow, Great Aunt Tom sounds like a really fascinating woman! I'm glad she lives on at least a bit through her notebooks. What an intriguing post Amy. I love the image, back story, and poem about your "Great Aunt Tom" how fascinating–as was the commentary you wrote about her when visiting before she passed on–difficult yet beautiful and rich moments. I love this! A notebook full of palm prints and a story of Great Aunt Tom... thank you so much for sharing these. And the Emerson quote to remind us that we live in the present. How interesting...I have so many unasked questions that are too late now. The trick for me is paying attention so I am aware now of those questions I may want to know later. Your Great Aunt Tom sounds like she was a character! How cool to have her notebooks. And yes to asking those questions... so many I wish I had asked of relatives who are gone. Amy, your poem titled Regret left me thinking of how lucky I am to have both parents still alive. They are in their 80's and my dad loves to tell stories over and over again. Now that my sisters and I are older, we don't tell him "we've heard this before dad." Instead we listen and watch others enjoy his stories. I myself listen closely so that I'll remember the stories well enough to retell.